I like to drive. I like people. I like to make extra money. And so, I drive with Lyft. We bought our house in early May of 2002. It was a cute Chicago Bungalow on a major street and super close to the Chicago Blue Line in Forest Park (just two suburbs west of downtown Chicago). The yard was tiny, but all that meant was that it didn't take long to mow it. Because we were on a busy street, we heard all kinds of traffic at all hours of the day. The rest of the block was owned by a single person who held those houses as rental properties and didn't take good care of them at all. But that didn't matter because ... it just didn't. While this was a perfect little house for us at the time, we started to realize that this was maybe not the best situation for our nearly 6 year old and 3 year old. Busy street means you cannot play in the front yard. And late night traffic would wake up the already sleep deprived parents, or worse, the kids. (then there was the time that a drunk driver flipped her car and hit the corner of our house --- the corner where our baby was asleep - nobody hurt, don't worry!). Tiny backyard meant that there wasn't much room to play. The rental properties cycled between high-vacancy, inconsistent tenants, and undesirable tenants (loud, obnoxious, drug-use, theft, etc), and various states of disrepair. Up until then, our focus had been on finding ways to cut out expenses. But what we really needed was to find a way to beef up our savings account with a new income stream. The search began. This wouldn't be easy. My wife (Molly) is a stay-at-home mom. Before we had our son, we had together decided that whoever was making the most money at the time would be the money maker, and the other would be the stay-at-home parent. This was important to both of us, and we weren't going to change this. We needed something convenient. Something where I would still see my wife and kids. Extra cash? With a 'stache? I was pretty much sold then and there. 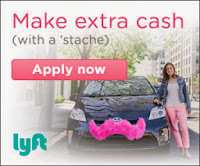 New to Lyft? Click here to sign up & download the app. Be prepared for some pretty sweet credits! I am the youngest of 3 kids, husband to an awesome wife, father to two great kids, caretaker to 3 hens, and perhaps a few other things. I live in the Chicago suburbs and have been driving for Lyft since September 2013. It's been an awesome time. Here, I will do my best to tell some of my stories. Got some free time? Need a little extra $$? 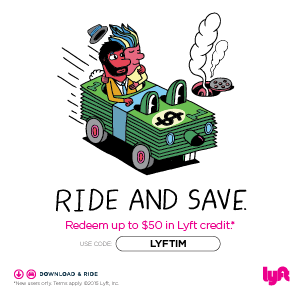 Drive with Lyft!